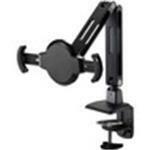 The amer amrt200c is an articulating tablet / pad mount with a sturdy clamp base. the stylish design and functionality of this tablet mount creates an ergonomic environment for the integration of a tablet in a business, school or at home allowing a whole host of applications. features include diagonal arm claws for flexibility in holding different types and sizes of tablets from 9 to 11 inches. it also has built in security or anti-theft mechanisms which include kensington lock a bracket lock and a key lock. all this provides added security for your tablet and the mount itself.